Today I came across this little fella. A happy, bright, cheerful gnome, dressed in green and shining love and joy. He was looking into my heart, my soul, reminding me that kindness is so important right now and that not everyone is feeling it or expressing it, or seeing it within themselves or others. Not everyone right now feels this Joy. Its Christmas 2016 and at this time of year, not all is well with all people and it is kindness that keeps many of us from going down the dark rabbit hole. Kindness of others, kindness TO others and kindness to ourselves. As he lured me closer, he illuminated the path behind him. This year it is natural and easy for me to feel grateful, kind, joyful, and a simple choice of the path of Love. But it hasn’t always been this way. Being misunderstood by my parents and feeling let down at this time. Feeling sad for my Mum who relied on charity while we were growing up in a single mother family to get her through this stressful time. Being torn in pieces with marriage break ups and being away from my own children. Not having the funds to make Christmas everything it could have been for my children as they were growing up. Not having the funds to gift my children and grandchildren something that would be valuable to them. Feeling alone, being alone and more. It has all been a part of my own evolution and whatever you may be going through is also a part of yours. It has taken a lot of work to turn my mindset around, and my life but if I can do it, so can you. This happy little gnome today reminded me that in ALL of those past situations, I HAD THE ABILITY TO CHOOSE TO FEEL DIFFERENTLY no matter what reality was showing or how it was showing up. The Happy path, the loving path, the KIND path. I think we can forget at this time of the year that we don’t have to compete with anyone. We don’t have to show up to please others. We don’t have to dig ourselves into a financial and emotional ditch so that others feel our value. We can begin right here, now, to feel the magnificence of who we are and then show up shining that energy. 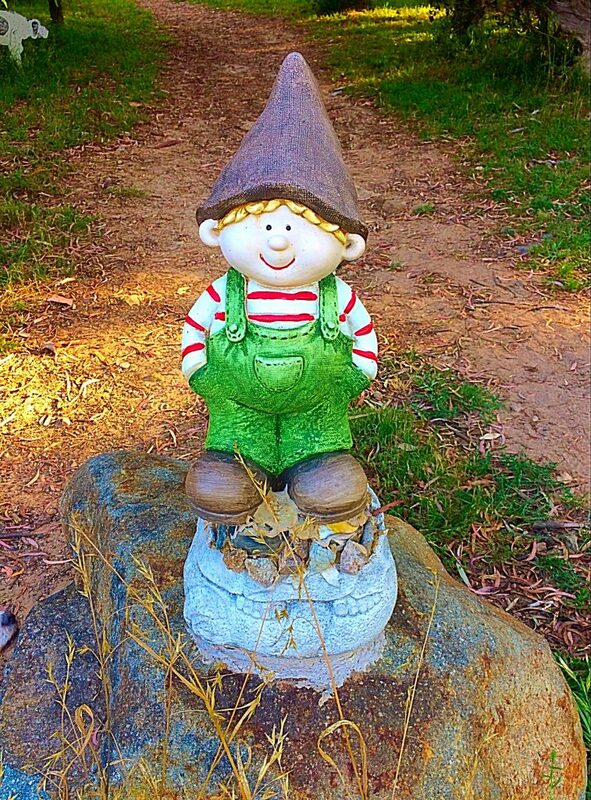 This happy little gnome has his hands in his pockets and a kind, knowing and peaceful smile. He is showing us all that to simply BE is ALWAYS good enough. Choose the Path of Kindness this year. Know that many people are suffering in silence, some are suffering internally but still showing up with a half smile and there are many who are genuinely happy! Kindness to everyone is the most precious gift we can give and receive. This includes the unconscious actions that we may be going through as humans such as road rage, rudeness at shopping centres, abruptness with retail staff or any other agitations we encounter either from ourselves or others. Kindness will ease the situation in most cases rather than having it escalate to higher tension! The path starts with you of course. Are you extending kindness, love and peace to yourself? Start there. Be OK with who you are, right now. YOU can light up a room just by walking into it filled with Joy. No presents required, only presence. May your New Year start on solid foundations of love and respect for yourself and others and may KINDNESS be your action word, your innate answer and your theme.